"First graders like to do," said a student about teaching Ocean Knoll students on April 19. 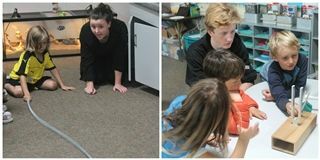 Upper School service learning group Educating Near and Far visited Ocean Knoll Elementary School to share lessons about sound frequency and pitch. They brought three separate tactile activities to help the first graders learn different concepts, such as how sound waves travel. The group teaches STEM lessons locally while also raising funds to build a school in Nicaragua.